By my count, that’s 22 books on pile. Now I remember a few years ago, on this same blog, doing a similar picture of my to-read shelf, and some of those that were on that shelf, are the same ones as the ones here… the bottom five in particular. I bought Rivers of Fire, and then realized it was the second book in the series, and still haven’t picked up the first. I’ve read part of the Jack London compilation, and I think I was in the middle of it when I got sick, and never returned to it. 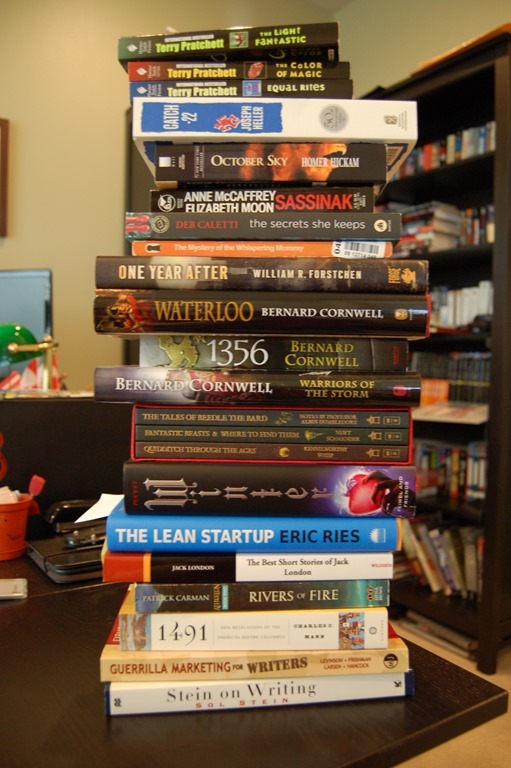 Many of the middle of the pack are more recent pickups – the three by Bernard Cornwell and One Year after are the ones I got on my last bookstore trip… and will likely be the ones I read next, because I can’t stop my self from reading Cornwell’s stuff. The four on the top of the pile are, unfortunately, my problem children. I started reading Catch-22 a while ago, and it just doesn’t make sense to me. I may try it again when I have less going on. And I really want to like Terry Pratchett’s stuff, but it reminds me a lot of Dr. Who, and I (I’ll probably be tarred and feathered for saying this), but I’ve seen 4 episodes of Dr. Who, and I just don’t get it. So this is the stack of the physical books I have, and that says nothing about the hundreds of books my wife has bought over the last few years on our Kindles that I haven’t started on, or the old boxes of Mercedes Lackey novels and other books my wife has stowed away in closets around the house. I could never buy a book again, and I would never get through the stack of reading I have in queue at my current pace. So since the former is never going to happen (due to aforementioned addiction), I’m going to have to pick up the latter. I’m not sure how or when… maybe I’ll just have to retire early in order for the weight of unread books on my selves from crushing me in a horrible biblio-accident. If you want to keep up with what I am reading, check out my Goodreads reading list. I’ve been trying to add books that I’ve read in the past, but that’s been a lot of work, so it’s a little behind. I just finished A Canticle For Leibowitz (another book which had been on my stack for quite a while), so now I’m going to pick up something lighter to absorb the rest of my long weekend.